The Mirror Foundation (Krajok Ngao) in partnership with Dynamic Logistics are stepping up efforts in the second year of an agreement to find Thailand's missing children. Posters on the side of delivery vehicles for the convenience store 7/11 will now be seen all over the country. Some 100 vehicles have been kitted out with posters, phone numbers and other online contact details. It is hoped that more of the estimated 1,000 children that go missing each year will be returned to their families. 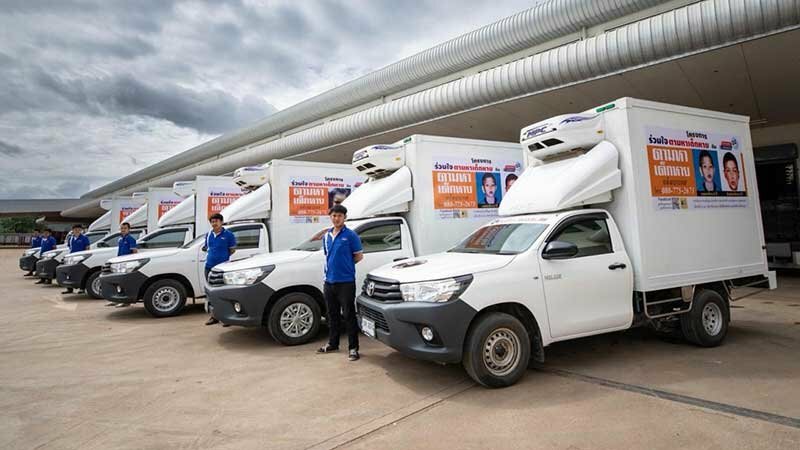 Jatukorn Chatyanon the general manager of Dynamic Logistics said that in the first year of the scheme vehicles in the central, eastern and south areas had posters. This is now being rolled out nationwide after agreement with CP All. No figures were given in the Thai Rath story for the effectiveness of the campaign in the first year. Good idea, If it brings one child home then it is a success. I think a lot more coverage could also be gained by putting them on the millions of plastic bags used in 7/11 too. I wonder how many children are sold or given to desperate mothers. Recent case of wife taking care of three children plus husbands parents, her salary recently cut B 2,000, husband lost job spends all time now drinking. Times are hard for many Thais. 1000 missing is an incredibly high number.